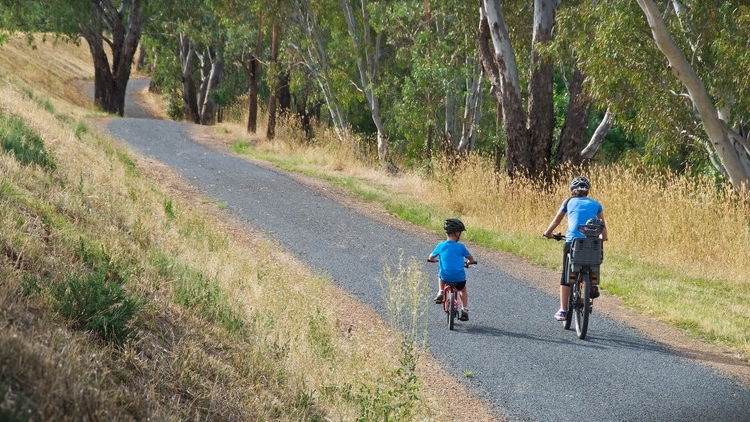 Grounded in our rich heritage, the Wagga Rail Trail will be a gift for future generations. Creating a healthy, sustainable and connected community, this trail will make Wagga Wagga a more vibrant and liveable city. Our project is to develop a shared, off road trail connecting the centre of Wagga to Ladysmith village. Stay up to date with the latest news and developments regarding the Wagga Rail Trail. The Wagga Rail Trail will be a 20km sealed, off-road trail connecting Wagga Wagga CBD with the village of Ladysmith. Following a gentle gradient through rural countryside, the trail will pass Governor’s Hill and Brunslea Park, Forest Hill and the RAAF Base, before crossing the picturesque Kyeamba Creek floodplain via historic rail bridges. It will be a safe, traffic free trail for passive recreation that everyone can enjoy. Starting at the Visitor Information Centre, the trail will mostly follow the disused Wagga to Tumbarumba railway line. Access to the trail will also be available at Equex, with links to the Kooringal Rd and Riverside cycle ways. The Trail will end at the Ladysmith Railway Station track head, with its unique display of heritage railway trikes. A management committee of landowners, trail users and community services will manage and maintain the trail for the benefit of the whole community. Recently elected Independent Member for Wagga, The Hon. Dr Joe McGirr MP is clearly in favour of the Wagga Rail Trail project and recognises the tourism opportunities that it will bring to our region. An exciting step forward has been confirmed in the development of the Wagga Rail Trail. The first stage of the planned trail, a 10km section from Wagga to Forest Hill, will effectively be built by Wagga Wagga City Council as part of their Active Travel Plan. The Wagga Rail Trail Strategic Directions and Implementation Plan that was commissioned earlier this year and presented to the Wagga community in September has been finalised and the feedback process concluded. Having welcomed and endorsed the Implementation Plan completed by Inspiring Place, the Wagga Rail Trail Committee has already started putting into action the major recommendations of the Plan. The disused rail line between Tumbarumba and Rosewood is set to be developed as the historic first rail trail in NSW. This is welcome news for the Wagga Rail Trail proposal, as the rail trail concept has now been brought into law in this state, setting a precedent for the future establishment of a network of trails across NSW. The original line was a vision to connect isolated and pioneer rural communities of the time. The potential benefits of this line were considered so important and valuable that there was considerable community debate and support for alternative routes before the final route was agreed. All of our supporters are invited to an open community forum that is being held as part of the community engagement being undertaken for the Wagga Rail Trail Implementation Plan. The Wagga Rail Trail committee is pleased to announce the official commencement of the Wagga Rail Trail implementation plan. It was our pleasure to welcome Adam Holmstrom and John Hepper of Inspiring Place to Wagga at the end of April, to begin phase one of the implementation plan. The vivid green Superb Parrot is a special bird that nests in protected bushland close to the proposed Wagga Rail Trail route at Governor’s Hill. With less than 5000 breeding pairs left in the wild, it is an extremely vulnerable parrot, classified nationally as a Threatened Species. It’s time to take a stand and make your pledge to support the Wagga Rail Trail. To bring the trail to life we need a design plan, which costs upward of $60,000. The ‘Make the Wagga Rail Trail Pozible’ Crowd Funding campaign was launched on Thursday night to a crowd of more than 100 local people at the Thirsty Crow Brewery. Last month our new Council voted unanimously to give in principle support for the Wagga Rail Trail. Mayor Greg Conkey put forward a Mayoral minute in favour of the project and spoke positively about the huge range of benefits that the trail could bring to Wagga. This month sees the Wagga Rail Trail project move into the next exciting stage of development. To bring the Wagga Rail Trail to life we need a design plan! Sitting in your car is bad for your physical health… and mental health too. Sitting in a car, on Kooringal Rd, Lake Albert Rd or the Sturt Highway n traffic for what feels like ages each day – sounds like great fun, doesn’t it? Come and visit the Wagga Rail Trail stand at the Brunslea Park Street Mingle next Saturday, 8th October from 1-5pm. This will be Wagga’s biggest street party and everyone is invited. Many trail supporters enjoyed the Gears n Beers Festival on the October long weekend, celebrating cycling, craft beer and cider. It was a great community event and attracted more than 1100 cyclists from Wagga as well as from across NSW and interstate. After the Local Government elections early in September, Wagga Wagga has nine newly elected Councillors, comprising six incumbents and three new faces. Fifty-three candidates are standing for Wagga Wagga City Council and we have spoken directly with twenty-six candidates so far, clearly articulating the outcomes we are seeking from a newly elected Council. Wagga Lake Run and Ride is a free community participation event for walkers, runners and cyclists. On Sunday 11th September, family groups, friends, sporting teams and serious fitness folk with all complete a 10km course through the streets of Wagga, finishing on the shores of Lake Albert. The Wagga Wagga Trail Marathon and associated events was held on the weekend, starting and finishing at Wagga Beach. There was a host of events for runners, walkers and MTB riders, as well as a great after party! These organisations are proud supporters of the Wagga Rail Trail: Brunslea Park, Bicycle Wagga Wagga, Committee 4 Wagga, Riverina Regional Tourism, Wagga Business Chamber, Wagga Wagga City Council, Wagga Wilderness Walkers Inc. Click to read their statements of support. — Warrick Lodge, General Manager Network Strategy & Sales , Regional Express.